Edinburgh Monarchs rider Max Ruml believes a “lack of experience” is the only thing holding him back and he feels confident he’ll turn things around the second half of the year and score the points the club expect from him. The American, speaking exclusively to the Evening News ahead of tonight’s Championship KO Cup first-leg tie against Glasgow Tigers at Armadale, revealed how tough it has been for him since joining Monarchs during the winter. The 21 year-old Californian said: “Things are getting better and I’m progressing in every match I do. I feel you have to make a good start in races especially in the league, there are so many top level riders in our division. “Everyone more or less knows how to ride a bike and, if you don’t make the start, it’s so difficult to pass anybody if you cannot get out of the gate. It’s been a massive change in culture as well as facing up to the challenges of an exhaustive home-and-away league programme for Ruml and he admits it has, at times, been hard to deal with. “It has been difficult but everything has been pretty much how I expected it to be when I came across to the UK. I struggled a bit at first, it takes time to try and find your consistency and getting on pace with everything. “But as time goes on I think I’m showing that I’m getting better all the time. Ruml went on: “I feel like everything is coming together. I’ve made a few mistakes that has prevented me scoring the points I should be getting. 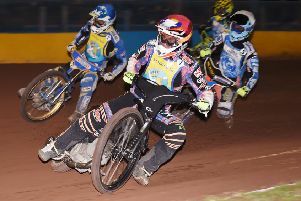 Despite his struggles, Ruml pulled off a stunning victory over Richard Lawson, one of Lakeside’s top stars. Said Ruml: “It happened in heat seven and everybody said it was a really good thing to have done. “I’m not too familiar with a whole bunch of riders over here but I was told Lawson is a very good rider and very knowledgeable on a bike. “For me to have caught him out in that race was quite an accomplishment especially since I’ve only had a few races under my belt. I was really excited about it, but it was only one race out of four. If I could do that in every race it would be even better. Glasgow have won all three derby clashes against Monarchs in 2018 but not by a landslide. And Monarchs may take some comfort from Glasgow’s surprise 56-33 home reverse against Workington Comets recently which was a major shock. However, it will be crucial that Monarchs win the first leg by enough to give them a fighting chance in the second leg at Ashfield on Sunday with the winners facing Berwick Bandits in the quarter-finals. Ruml and his team-mates are still reeling from Matt Williamson’s shock decision this week to take a break from speedway due to stress. The Armadale outfit have signed former Glasgow ace Coty Garcia as a temporary replacement which may become permanent depending on how he performs against his old club this weekend. “I have kept myself fit since I last rode for Redcar in 2017 and I’m keen to show fans what I can do,” said Garcia.